It was a rather gray and rainy day. I finished my first week of my summer econ class and now have three weeks left of it to go. The class is still going fine, but somewhat annoyed me today when we had our first quiz and I got about half the questions correct. I’m understanding the subject better with this professor, but I still get confused with some the econ concepts. I’ll just have to redeem myself by studying this weekend because the first exam is Monday and exams are a huge portion of the final grade!! I dislike rain sometimes especially when the rain is just nonstop and how it makes everything look so gray and blah. I decided to wear some color in my outfit today to offset this gloomy weather by incorporating purple and red with black. 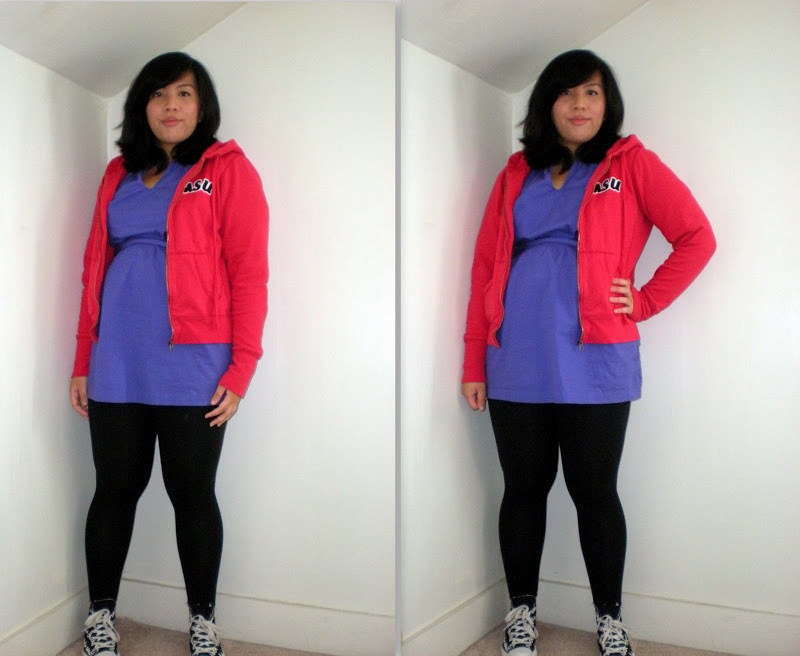 College Zip Up hoodie, Converse One for Target tunic, Target leggings, Converse High Tops. cute and comfy! you look great! Your company will be great for those next 500 😉 you're such a doll!!! Lovely. I would've never thought of putting red and purple together, but you make it work. p.s. would love you to enter my giveaway!!! i've said it before, i'll say it again – bright colours look amazing on you.